MLM business is booming in all aspect in today’s day and age. People are reaping profits off the MLM business market on a left right and center basis. An MLM software forms a core part of many of these success stories. It is a software that is designed to manage a MLM business and the distributors on the network. It is a network marketing management tool that helps in giving out payments to the distributors as per the compensation plans in a timely and accurate manner , manage sales and inventory and the track the overall progress of the business easily. If you are a network marketer, you will understand the importance of branding in the business. The same applies for the MLM software that you use as well. If you can place the name of your company (or brand) on the software, you can have them on the reports you generate through the software, get the name on your website, give replicated websites with the company name to your downlines and much more. This sort of MLM software that is developed by a team of developers out of your league which permits you to put in the name of your company or its brand on it is called White Label MLM Software. If you are paying for a white label privilege in MLM software package you are using for your network marketing business, then it is perfectly alright to insert the name of your brand on a product that is developed by another person. White label MLM Software is quite an advantageous addition to your business for a number of reasons reasons! Let us explore them, beginning with the basics. A white label allows you to legally place the name of your company or brand on a product or service that has been developed by someone else. This party will charge a fee for the development of the product and will forfeit all the rights and claims on the product post that. White labeling technique allows you to sell products and services just as your own minus the time and money that has to be spent on designing and developing them all by yourself. White labeling is employed in almost all the industries in the world, right from food service to business marketing. In business marketing, reports related to the performance of the website are typically generated by a third-party tool, and white labeled before send it to the client. A white label MLM software does similar duties, in the context of MLM business. What are the benefits to white label MLM software? 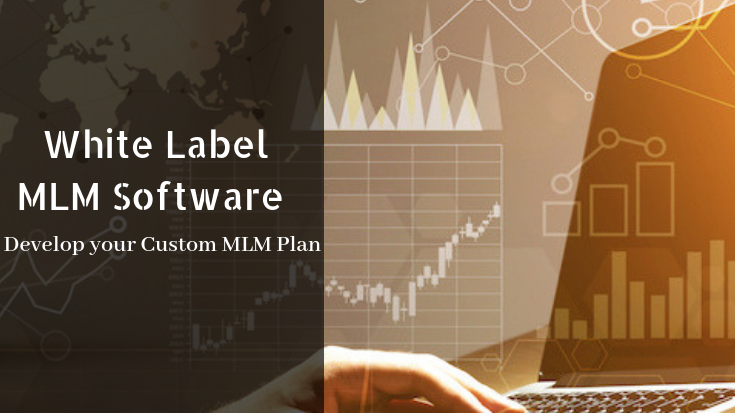 Initially, you may feel that white labeling MLM Software is a very costly affair but in the long run, it is a very cost effective addition to your network marketing business. You will feel that having the name of your company on a third-party tool is not that essential for the business. Well, we suggest you give a serious rethinking on that matter. You would want to consider the following reasons and then form your final judgement! 1. White labeling boosts the presence and visibility of your company. MLM business requires you to offer multiple services as well as products from a lot of third-parties. In such cases, paying extra for white labeling MLM software is a great way to put in your brand name without sounding obnoxious. This will help in increasing the public’s awareness of your MLM company..
2. White labeling helps in enhancing the loyalty of clients. In case you are opting for third-party services for your MLM business and are white labeling and adding to your services, you should take care that they are dependable and satisfactory. Each time a client uses your white labeled product and sees your company name attached to it, they will associate it with convenience and quality that you offer and their loyalty to your brand will increase with time. 3. White labeling gives you the permission to take advantage of expert work. Let us face the reality! The third-party developers that you employ to develop your MLM software have the focus and expertise to make it better than you can ever do! You just need to just pay them for the white labeling privilege and enjoy putting in your brand name on their quality work. 4. White labeling MLM software provides your company with a refined product. The MLM software and related products that you buy from third-parties will have already been subjected to beta tests, revisions, troubleshooting, and many other fine tuning processes. Instead of going through the daunting troubles of launching your own product, you can get an already-polished and fine tuned product with the name of your company attached to it. 5. White labeling saves you a lot of time, effort and money. Well, it might sound like a cool idea to create your own MLM software from scratch, but unless you have done it before in a successful manner, you probably are overestimating your capabilities and is not aware of all the energy and resources that go into creating a fully functional MLM software. Why should you waste time going through the tiresome process when you can white label MLM software for a very nominal fee? 6. It gives you the privilege to choose. When you choose to white label your MLM software, it opens up a wide range of product options and service options for your business. You do not have to waste time developing a single product when you can white label and choose from all the available options out there. 7. White labeling MLM software takes the pressure off. If something goes wrong with the MLM software or a complaint arises from the client, most of the third-party developers will take responsibility of the flaw and work on to fix it or update for the service or refund the entire cost of the product if none of it works. However, it is your responsibility to choose a quality product from a reliable third-party developer that offers dependable support. Once you are done with that, you can sit back and enjoy running your MLM business in a smooth manner while someone else does the troubleshooting. 8. White labeling is similar to having an in-house developer, for just a fraction of the cost. Maybe , you really like the idea of building your own product, but you are also interested in high profit margins. If you are considering to develop your own MLM software, you are looking at investing tons of money and time, with almost no guarantee of the final product’s ROI. When you use a third-party developer and white label MLM software you get from them, you are paying developers or manufacturers to create a product for your business. And of course, paying for white labeling is a a lot cheaper than paying a developer to build a product for you. Now that we have understood the benefits of White label MLM software, we highly recommend that you get one today! In the background of stiff competition in the network marketing business, it is better to get a fully featured white label MLM software. Infinite MLM Software can help you there. Learn more about How to succeed in Network Marketing Business? Our MLM software is widely appreciated by clients around the world and has all the requisites to boost your business. It is customisable to suit any compensation plan that you follow. It also supports multiple currency and multiple languages so that you are not restricted by geographical constraints when expanding your business. We also have multiple add ons like e-pin, e-wallet, email notifications, sms notifications, e-commerce integration and much more that you can avail at very nominal price. See the entire range of features and add ons of Infinite MLM software. Check out Infinite MLM Software Demo.